We have survival backpacks, emergency food storage and all sorts of prepper supplies for families of every size. 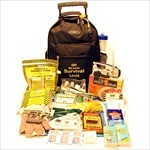 Our 72 hour kits are designed using advice from experts in the emergency preparedness industry. Acorn Supplies has over 10 years of Emergency Preparedness experience, and is a family owned business. We take take survival serious, and offer the highest quality products in the survival industry. 1. Food storage and water. Having an adequate supply of food and water is absolutely essential to have peace of mind through an emergency. If roads are disrupted or other problems occur to keep you from getting outside help, you'll need to be able to take care of your basic necessities by having your own food and water. 2. Cooking apparatus. Almost as important as having food is having a means of preparing and serving that food. You may want to look into buying a propane stove or other cooking devices that don't run on electricity. 3. First-aid kit. Depending on the emergency, you may need to treat family members for injuries, ranging from mild to serious. Be prepared with a well-stocked first-aid kit. You can also take CPR and first-aid classes to help you know how to treat different ailments. When a hospital isn't an option, you need to be the physician. 4. Phone or CB radio. Have a means of communicating with other people. Cell-phone towers may not be operational in a power outage, so it's a good idea to have a home phone line or even a CB radio. Both of these can be extremely helpful in letting you inform authorities of dangerous conditions and also in finding out if relatives are all right. 5. Generator. You may want to invest in a generator so you can have power to cook meals, keep refrigerators functioning, turn on lights and do other things you ordinarily wouldn't be able to do in a power outage. You'll have to maintain a supply of fuel for your generator, if you use this option. 6. Basic tools. It's a good idea to have basic repair tools on hand if you need to fix items around the house. 7. Fire extinguisher. You should have a fire extinguisher handy in case a fire breaks out. A good place to put fire extinguishers is near your kitchen and in other areas of the house that are prone to fires. That way, you can get easy access to them to stop fires from spreading rapidly. 8. Blankets and firewood. Depending on the time of year, it may be essential to have blankets and firewood to protect you from cold conditions. If the power goes out, you should be prepared to start fires to keep yourself warm and even to cook your food, if necessary. 9. Extra sets of clothes. If you're unable to use a washer and dryer for an extended period of time, it's nice to have several pairs of clothes you can use in the meantime. If one pair of clothes gets wet and cold, you can always use another to stay dry and warm. 10. Flashlight, shoes and gloves. Keep three things near your bed at all times: a flashlight, a pair of shoes and a pair of gloves. If something happens at night to break your windows or cause other damage, you'll be glad you have a pair of shoes and gloves to avoid getting serious cuts. Also, a flashlight will help you navigate your way through the dark. With these 10 pieces of survival gear, you'll be able to rest easier and feel more prepared if an emergency comes. We're dedicated to ensuring you have a convenient and seamless shopping experience with us. We carry Mayday and Guardian Survival emergency products and fulfill our orders using Fishbowl Warehouse to make this possible. Thank you for visiting us at Acorn Supplies!